It's hard to believe it's taken this long, but Powers, the long-running superhero noir by Brian Michael Bendis and Michael Avon Oeming, has been picked up for a television pilot for the FX network. News came over the weekend that an impressive troupe of talent will be behind the show, including writers and directors associated with hits like The Walking Dead, The Shield, Justified and Sons of Anarchy.Launched in 2000 at Image Comics and presently published by Marvel's ICON imprint, Powers is a gritty police procedural set in a world that's filthy with superpowered heroes and villains. A natural fit for a high quality television drama, the series stars veteran Christian Walker and rookie Deena Pilgrim, homicide detectives in the "powers" division, and depicts the growth of their relationship while revealing more of the expansive back-story of the dark and violent Powers universe, including the truth about Walker's secret past. 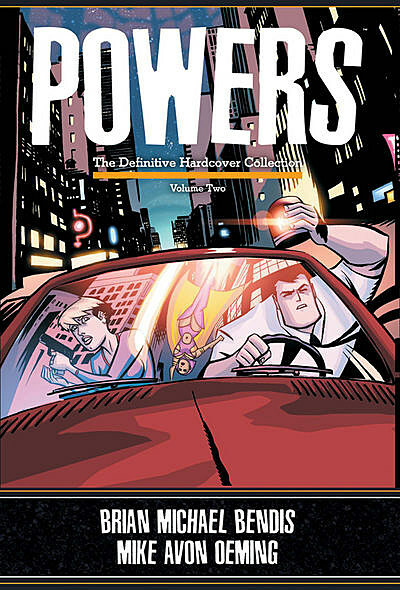 Available in several collected editions (including deluxe hardcover versions), Powers is one of the most consistently excellent creator-owned titles published in the last ten years. Co-creator Brian Michael Bendis discussed the news on his Twitter feed, writing, "I woke up to an insane amount of good will and nice messages. Thank you all. Powers fans, you really made this happen. New issue Wednesday!" The Powers FX pilot is to be directed by Michael Dinner, who Deadline reports has been instrumental in getting the project going. Dinner directed the pilot of and executive produces FX's Justified, and also helmed the pilots for the network's Sons of Anarchy and in-development Outlaw Country. Writer Charles H. Eglee comes to the Powers pilot after working as an executive producer on AMC's The Walking Dead, itself an adaptation of a great creator-owned comic book series. Perhaps most auspiciously, Eglee was an executive producer on FX's classic cop show, The Shield. Produced by Sony Pictures Television, the Powers pilot is expected to begin casting right away.